Conferences, such as the inaugural Connecting Women in STEMM National Symposium, can be rich with sponsorship opportunities. I don’t mean the kind of sponsorship where an organisation supports the conference through funds or resources. I mean the sponsorship that delegates can provide for each other. Separating out sponsorship from under the umbrella term of mentoring has allowed us to identify how crucial sponsorship is to building successful and productive careers, and to identify the actual informal sponsorship practices or behaviours. Sponsorship practices involve people playing an active role in the careers of others. This creation of opportunities is a form of ‘activated mentorship’, where the sponsor draws on their power, networks, resources, expertise, social capital and influence on behalf of another. However this makes it sound all very formal, where the reality is that we can all engage in sponsorship ‘micropractices’. And we don’t have to wait for someone senior to do it, we can be sponsoring others regardless of our seniority or theirs. For example one important sponsorship behaviour is making people and their work visible. Someone might introduce me in the following way, ‘This is Dr Jen de Vries. Jen is conducting a mentoring program at our Institute and has been sharing her research on sponsorship with us and how important it is to women’s careers’. Creating connections and extending networks is another sponsorship behaviour. This could be connecting two people who you know have a shared interest. Yet another sponsorship behaviour is endorsing someone’s work. 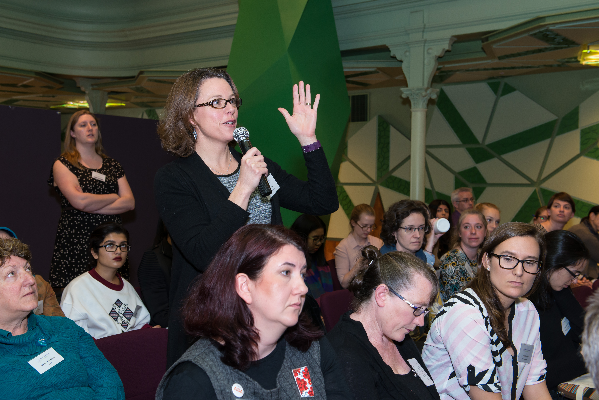 ‘Jenny has just taken on a leadership role and writes this incredibly interesting blog about being a woman leader in science. Let me introduce you. I think you’d really enjoy meeting her in person and following her blog’. At an academic conference sponsorship can involve making sure you introduce your PhD student or postdoc to the big names in your field and create the opportunity for them to converse. Not just ‘this is my student Eleanor’, but fulsome introductions that outline their area of research and the good work they are doing. In this case as their sponsor you are engaged in all three of the practices I have outlined, creating visibility, connecting and endorsing. Of course conferences, by their nature, provide many other opportunities for sponsorship. Keynotes, moderators, and panel members have all been provided with an opportunity and they can act as sponsorship multipliers, using their highly visible platform to endorse others and cite their work. At a conference I attended the very eminent keynote speaker spoke at some length about the fascinating work of a postdoc she had met as they both travelled to the conference by train. What great role modelling. Each of these sponsorship behaviours plays another role – they validate the person and their work. Particularly for women who work in areas where validation may be in short supply, this is critical to building confidence and self-esteem. In the age of social media, we can all be adept sponsors, liking a blog, re-tweeting a post, tweeting about events, promoting this conference. This is the way we build a movement as well as support the development of individual careers. Some people seem like natural sponsors. A number of the Women in STEMM Australia Executive spring to mind! They have a generosity of spirit, have learnt the art of advocacy, the importance of networks and the use of social media. They’ve had to, to support each other, to build a national association for women in STEMM and to build a strong movement for change. However sponsorship shouldn’t be left to them. The philosophy of ‘paying it forward’ applies to all of us. Everyone can learn to be intentional sponsors. Some of you might be shrugging your shoulders – ‘of course we sponsor others in the ways you’ve suggested, and in many other ways’. However as I’ve been presenting my research on sponsorship to groups, and particularly women’s groups, I’ve learnt not to take anything for granted. What is ordinary and assumed for some is a mystery to others. However, once we understand the importance of sponsorship in people’s careers, we must do everything we can to strengthen these practices, particularly for women. I hope you pursue potential opportunities to engage in sponsorship following the recent National Symposium.